Become a part of the action as we cruise alongside these awesome yachts as they begin their journey through the Sydney heads and out into the open sea. 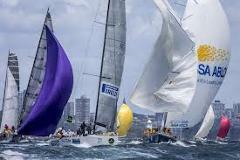 Departing King St Wharf 8 at 10:45am for a 3.5 hour cruise along the gorgeous Sydney Harbour, you will have a birds eye view of the exciting start to this iconic yacht race. Enjoy the race in the luxurious comfort of the Jerry Bailey and superior service of Sydney Princess Cruises. * Delicious 3 course BBQ buffet with fresh seafood, salads and fresh bread rolls. All of this for $110 per adult and $65 per child.